Figures 1a and b. The patient’s mildly irritated rash, shown here affecting the cubital fossa (a, above) and neck (b, below). 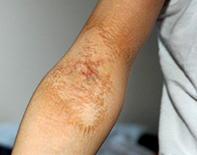 An 8-year-old Asian boy with a history of atopic dermatitis presents with a hyperpigmented and superficially eroded eruption involving the cubital fossae (Figure 1a), popliteal fossae and neck (Figure 1b). It is irritable but not itchy. The rash has been present for two weeks and has not improved with oral cephalexin and topical betamethasone dipropionate 0.05%. Skin swabs reveal no pathogens. The patient’s current treatments for atopic dermatitis include his usual moisturiser, topical corticosteroids for flares and a bath oil containing liquid paraffin and triclosan. The patient was diagnosed with an irritant reaction to triclosan. Hyperpigmentation after skin injury occurs commonly in people of non-Caucasian races, such as in this case. Triclosan is an antiseptic that is commonly found in bath oils marketed for ‘flares of eczema’. When used to excess, it can produce an irritant reaction that is similar to a superficial chemical burn. This is not an allergic reaction, and patients can tolerate exposure to a lower concentration of triclosan. This reaction to triclosan is a spot diagnosis, without a differential if there is a history of use of this antiseptic. If this is lacking, the patient should be questioned about exposure to other similar chemical irritants. The eruption of pellagra (vitamin B3 deficiency) can have a similar appearance, but this is most unlikely in a well nourished child. Treatment for this irritant reaction simply involves ceasing use of products that contain triclosan and continuing to apply moisturiser. The rash will resolve within two weeks. Addition of a small amount of sodium hypochlorite (bleach) to bathwater has been shown to be an effective way of reducing skin infections in eczema.1 It is true that skin infections, usually caused by Staphylococcus aureus, are a common trigger for eczema flares. Using bleach rather than antiseptics in the bath is an effective and cost effective way to reduce carriage of S. aureus, which may flare eczema, and to avoid irritant reactions. 1. Huang JT, Rademaker, A, Paller AS. Dilute bleach baths for Staphylococcus aureus colonization in atopic dermatitis to decrease disease severity. Arch Dermatol 2011; 147: 246-247.